I haven’t posted anything lately on my 1950’s SF novels review project, so after taking yesterday off for getting shot sixty-seven times in the left eye by a laser (by actual count, though I may have missed one or two blasts because the doctor was pretty quick on the trigger), I thought I’d get back on track with a review of this forgotten minor classic by two of the great sf writers of the 1930’s – 1950’s. First, a brief intro in case you’re unfamiliar with their names. 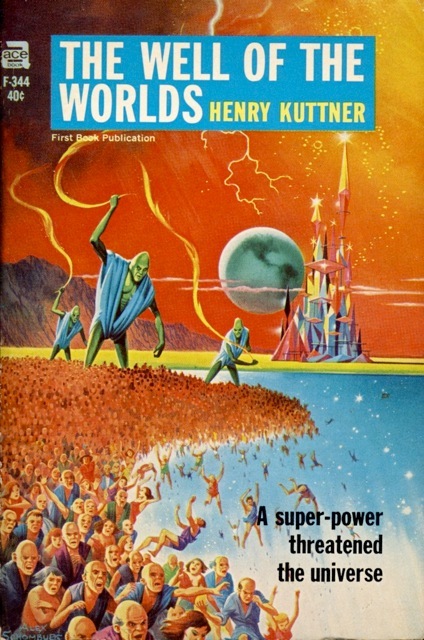 Kuttner was a teen-aged prodigy published in Weird Tales. He corresponded with the Old Gent himself (H.P. Lovecraft) and was a very prolific pulp writer. He wrote a fan letter to C. L. upon reading “Shambleau” (Moore’s first story and a classic adventure of Northwest Smith on a decadent Mars) in WT. He was astonished to discover that C. L.’s first name was actually Catherine. They married in 1940 and from then on formed the greatest wife-husband writing team in SF, and, for all I know, all of English literature. Their collaborations were numerous and seamless. At times one would leave the typewriter in the middle of a sentence and the other would pick right up and continue the story. Their stories were usually published under Kuttner’s name (his word rate was higher, as Moore herself explained) or under pseudonyms the prolific pair shared (eg, Lewis Padgett). This fact has led to some confusion (as they did occasionally author solo efforts) and, in fact, two of the three excellent sources I rely on attribute WELL OF THE WORLDS to Kuttner alone, but in this case I will agree with the minority and attribute it to both. We can discuss this in footnotes, if you’d like to delve into the matter further. WELL OF THE WORLDS has a moderately complicated publishing history. 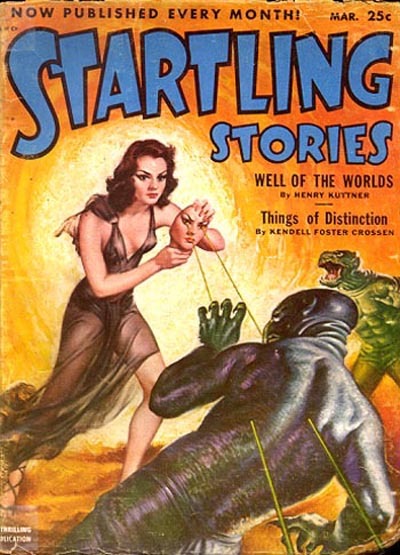 It first appeared in STARTLING STORIES (March 1952) under Kuttner’s byline. 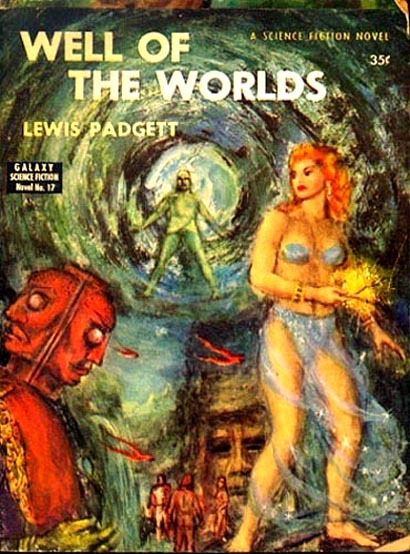 It was republished almost immediately In the GALAXY SCIENCE FICTION NOVELS (#17, 1953) as by Lewis Padgett. Its first book publication was as an Ace PB in 1965 (see featured image for cover). I don’t understand why that took so long. Kuttner, sadly, died in his sleep from an apparent stroke in 1958. Moore married again in the early 1960s after writing for television for a few years. Apparently her new husband despised the SF field, and she wrote no more fiction. She passed away in 1987. The review below is based on my usual 100 point format. As veteran readers know I’ve been at this for awhile. This is the 97th novel on my ’50s scorecard. It ranks (so far) as tied for the 11th best SF book of the 1950s, and is the best of 1952, a year with an atypically large number of pretty good novels. The vintage Ace PB is not difficult to find on eBay for under $10 (including shipping). It was also reprinted in 2009 by Wildside press.